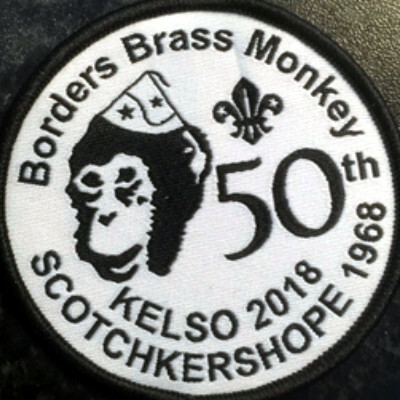 On Saturday 27 January 100 Scouts and Young Leaders arrived at Kelso racecourse ready for the Brass Monkey camp, and to celebrate 50 years since these started in the Borders. In 1968 Jack Robb, the DC of Roxburghshire, decided to run a one-night camp to challenge the Scouts. He decided to code-name it the Brass Monkey camp. The first one was held in Scotchkershope and had around 45 Scouts in attendance. The camp was a huge success and very quickly over the next few years attracted Scouts not just from the Borders but from all over Scotland, England and even Wales. 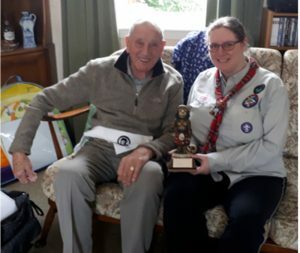 Local Scouter Bill Watt got involved from the early camps and recently Marion Macintosh, one of the Borders ADCs, had the great pleasure of visiting him and letting him know how it is still running and showed him the trophy we use. He remembers one camp where it was so cold they had to go to the local ironmongers to get large iron nails instead of pegs! Bill still has his original neckie! He is very pleased to hear that we still keep the book going too! The largest camp had over 400 in attendance. Every participant that attended was awarded their Brass Monkey neckie and later a badge. One camp in the 80s is noted as being so cold that the calor gas bottles froze overnight!. The Scouts were unable to take up their tent pegs due to the frozen ground and when the camp returned to this site in 2009 tent pegs were found! The venue for the Brass Monkey camp changed every year. One of the traditions that started early on is that the participants were all asked to sign the Brass Monkey book. This tradition is still on-going and it’s great to be able to look back over the years at the history of the camp. In 1984 a trophy was presented as a gift from a Scout group in Wales. It was to be awarded to someone that had contributed to the running of the camp. This trophy is a Brass Monkey in a kilt. It was first awarded to Jack Robb and it is still awarded today. In the past there were also pottery mugs and pottery woggles! This year’s camp took place at Kelso racecourse where the Scouts camped on the side of the racecourse. They had an afternoon of activities, a mixture of fun, adventurous activities and Scouting skills, including, for the first time, axe throwing. 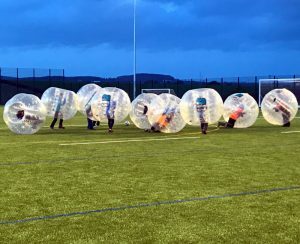 They were also treated to bubble football at Kelso High School where the main concern was that the Scouts might actually take off in the wind! The evening activities included Zumba and a movie with the Sunday morning seeing all the participants take part in an ‘urban-eering’ course around Kelso. The Young Leaders at the camp were given the opportunity to work with the ESL (YL) on their Young Leader missions and modules, too. The weather, whilst not as cold as the previous weekend’s snow, was windy and, in true Scottish fashion, a bit dreich. The Scouts and the leader team all had a great camp and are looking forward to next year’s camp. Happy 50th to the Borders Brass Monkey camps!